OutWorlders Game Night | OutWorlders, Inc.
First Saturday Monthly Gaming Night. 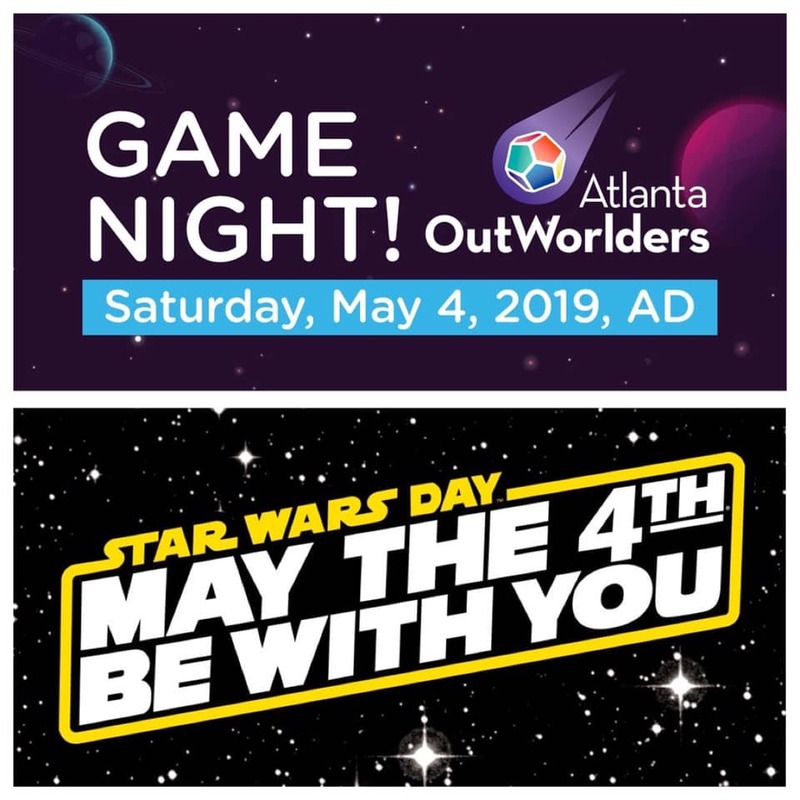 There's no better time to celebrate Star Wars than at OutWorlders Game Night on May 4th. The trailer for "Star Wars Episode IX: The Rise of Skywalker" just dropped and we are pumped! If you've got a Star Wars or space themed game - bring it! We'll have a Star Wars related donation jar question. Themed snacks and drinks appreciated! Feel free to come in cosplay. Bring your fellow Jedi! Need players or want to try a specific game? Post in the Facebook Event Page. The event is Adults only and BYOB. Most members bring a snack or drink to share. If you are new to Atlanta OutWorlders, Game Night is the 1st Saturday of every month. Game Night is a FREE event, and we do accept donations to keep event and venue costs down. All of our events are free and you do not need to be a member to attend. Consider sponsoring us for a $15 membership fee, good for 1 calendar year. Sponsoring members are eligible to vote in upcoming elections and incoming business proposals. We also accept donations to help keep administrative and venue space costs down, as well as, continue to grow the club! Parking is pretty decent, you can park in my driveway and anywhere on the street, just don't block other driveways. When you park in the cul de sac, don't parallel park, just head-in park. We can get more cars in that way. Robert and Jack do have a domesticated cat. Take 20 East to Flat Shoals Exit. Turn Left on Flat Shoals. At next light, turn Right (Fayetteville Road). At next light, turn Left on to Brannen. At next road (Boulder Rd.) turn Right. Boulder goes right into the subdivision. From points East, you can take 20-West to the Gresham/Flat Shoals exit. Go forward through the light at the end of the exit ramp to go to Gresham. At first light after 20 (across from Bigelow's) turn right onto Welland ave. Follow that around to a stop sign, turn left onto Brannen. You can take Second down to Flat Shoals, turn right. At next light (Gresham) turn left. Bus #9 goes along Brannen Road. Bus #34 goes along Gresham Road. Bus #32 goes along Bouldercrest Road.